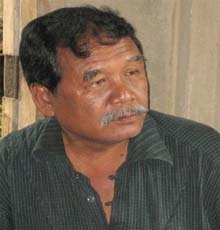 Mr. ZuamLian is a Bawm community leader and expert on CHT Indigenous peoples. He is the Chairperson of Movement for the Protection of Forest and Land Rights in Chittagong Hill Tracts (CHT) Bandarban Chapter. He is also the convener of Bandarban Hill Tracts Land Owners and Timber Trade Association. As a freelance researcher Mr. ZuamLian has been involved in many key studies on the CHT. He speaks Bengali, English and a number of indigenous languages such as Chakma, Marma, Lushai, Pangkhua, and Bawm. He has participated in many a national and international seminar, symposium, workshop, conference and meetings on indigenous and CHT issues. He also conducted a study on Natural Resource Management of Indigenous Systems in Bangladesh (2006-07) for RIPP-Bangkok. His major relevant works in CHT on behalf of Human Development Research Centre (HDRC) are— State of Development in Chittagong Hill Tracts (2014), conducted with support from UNDP-CHTDF; Status and Dynamics of Land Rights, land Use and Population in Chittagong Hill Tracts of Bangladesh (2010), conducted with support DANIDA; Socio-economic Baseline Survey of Chittagong Hill Tracts (2009), conducted with support from UNDP-CHTDF; Socio Economic Baseline Survey and Livelihoods Assessment of CHT Watershed Co-management Activity (CHTWCA) for UNDP-CHTDF; and Agricultural Production Practices in Chittagong Hill Tracts (2017), conducted with support from Manusher Jonno Foundation.